Guinea Pig Noises - They Have a Lot to Say! In the past, I've shared a lot of interesting noises that pets make. So far, I've shared a crabbing sugar glider and a hissing hedgehog. Today, I wanted to share some guinea noises. Yep, guinea pigs are not silent creatures and can actually make a lot of noise. Guess they have a lot to say! This first noise is commonly called a "wheek", because that's kind of what it sounds like. The guinea pig in this video is wheeking because he's excited about getting some tasty bell pepper to eat. We used to make guinea pigs make this noise a lot at the vet's office when we were doing things to them that they didn't appreciate. Of course, it was more of a distressed and shrieking wheek at the vet's office. The next noise is called "chirping". It sounds just like a bird chirping and it's a pretty rare noise. I have never heard a guinea pig make this noise in person, but think it sounds really cool. Did you know that guinea pigs can also "purr"? This is one of my favorite guinea pig noises. I used to love making guinea pigs purr at work. I'd scratch their little rear ends and they'd love it! They kind of start vibrating all over when they purr - too cute! There are a lot more guinea pig noises than the ones I shared here today, but these are just a few of my favorites. Did you know that guinea pigs could talk so much? Which noise was your favorite? We´ve a saying in German, literally "I think my pig whistles!" (means "Blow me down!") 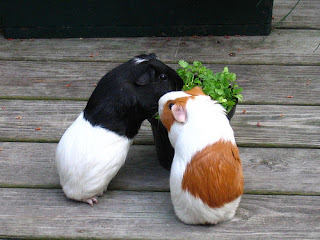 ... must be up to Guinea Pigs :) I love Guinea Pigs, they´re so adorable. Hmmm interesting! I love them too, they are pretty awesome little creatures. Thanks for following BOTH of my blogs btw Janis. Look forward to following yours as well. Those guinea pigs are just adorable. Have a fabulous Friday. didn't know guinea pigs could chirp ! that is funny !!! I know - they sound just like little birdies! Love this post! Guinea pigs are a new pet to us and I've been trying to figure out his little noises! He defintley has the wheek when he hears my voice in the morning because he knows it's time to eat! Love when they purr! I just love it when they "purr"! Especially because they kind of vibrate when they do it. They are too cute and I always love their accent! Those sounds bring back some memories!! Love the purring! have a great weekend! I have never heard a guinea pig chirp! We played it for miss Piggy our guinea and she sat up looked around and continued to eat her hay. Thanks for sharing all the noises with us. We would have never heard it if it wasn't for your blog. Maybe Miss Piggy will start chirping soon! That would be so cool. We miss our piggy! Loved talking with her. Our owner loves it when we wheek for food! Love the post, just too cute! Wheeking is just too cute!